« What does NAMUR NE 43 do for me? How do I set upper range value and lower range value on a Siemens pressure transmitter? A customer needed to re-range a Siemens SITRANS P DS III transmitter without applying pressure. He’d read my earlier blog post about using the pushbuttons to program the DS III (Pressure Transmitter Pushbuttons to the Rescue! ), and where to find the Z-fold instruction sheet. All was going to plan, until he started looking for the settings for lower range value (LRV) and upper range value (URV). And then, in an all-too-familiar scenario, he hit a roadblock. The instructions don’t actually mention URV and LRV, the terms he’s familiar with, by name or acronym. So what’s a guy to do? On page 6 of the Z-fold instructions, there are a list of Mode codes that correspond to the settings he needed. Sets transmitter lower range value (LRV). Siemens uses MA to denote start of scale, or bottom of range. Sets transmitter upper range value (URV). Siemens uses ME to denote full scale or top of range. The transmitter’s digital display shows the M (Mode) setting number in the lower left. 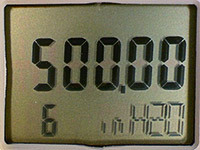 In the photo, the 6 in the lower left of the screen indicates that the value above (500.00) is the URV setting. The Up and Down arrow pushbuttons adjust the value. The M pushbutton saves the value once you have it set to your required parameter. M2: Set and adjust MA and M3: Set and adjust ME are for what I call ‘wet’ ranging, using for ranging the pressure transmitters in level applications. Apply a pressure corresponding to a low level (4.0 mA), and M2 will use that for the lower range value. Apply the pressure corresponding to the high level (20.0 mA), and M3 uses that for the high level range value. The zero trim adjustment is aptly called M7 Zero adjustment. Zero trim is typically done on low pressure range transmitters to compensate for any zero offset due to installation factors, like out-of-plumb, elevation offset or not level. You’ll use the pushbutton Up and Down arrows to bring the reading to zero (when the applied pressure is at zero). The M button locks in that offset as the 4.000mA point. Check Lesman.com for complete specifications and user manuals on the Siemens SITRANS P DS III transmitter. This entry was posted on February 21, 2012, 4:46 pm and is filed under Configuration, Installation, Level Technology, Pressure, Pressure Transmitters, Siemens, Transmitters. You can follow any responses to this entry through RSS 2.0. You can leave a response, or trackback from your own site. On a related note, can we have a conversation on steam drum level control and calibration? I’d love to hear a common sense approach (if there is one) for electrical guys like myself to this perplexing (in my estimation) topic.